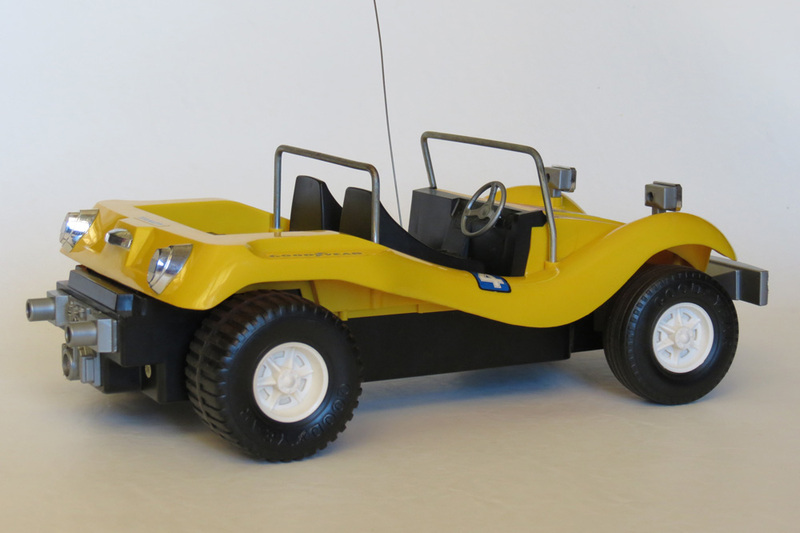 In the days prior to the more typical sand-rail or baja buggy-styled R/C cars of the mid-1980s, an “off road” toy-grade R/C car tended to be more of a Meyers Manx style dune buggy design. 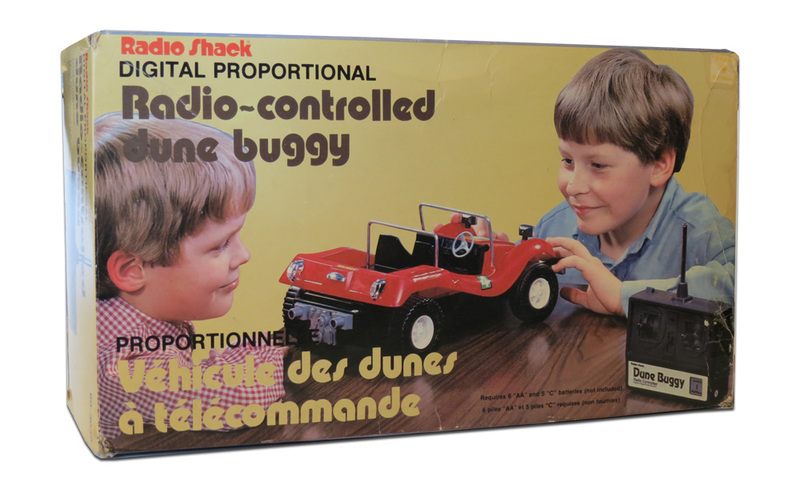 The “Dune Buggy” was the first ever Digital Proportional R/C toy sold at Tandy/Radio Shack stores, and was available from 1981 – 1982. Retailing for AU$79.95 (the equivalent of AU$266 in 2010 money), this car was manufactured by Nikko and licensed/rebranded by Tandy/Radio Shack for sale in their stores – who clearly decided to give it the very original name of “Dune Buggy”. But I guess they were very early days of R/C, and for Tandy customers this name was an easy and obvious way to introduce the idea of an R/C car that could go off-road. Well, sort-of off-road. The original model released by Nikko was actually called the “Nikko Road Star G2”, and in fact, you can still find this name embossed on the underside of the chassis on the Tandy/Radio Shack release. I’m not sure if the Nikko Road Star G2 was ever sold much outside Japan. So by far the most well-known examples in the West were the ones sold at Tandy/Radio Shack stores, thanks to their vast distribution network back in those days. 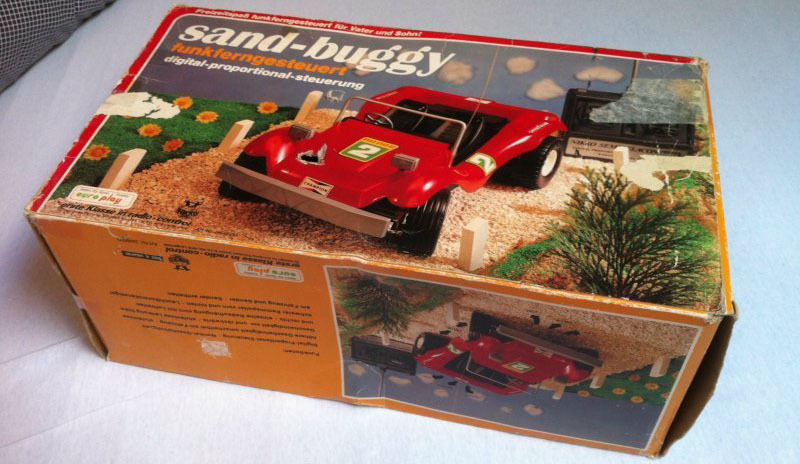 Without doubt, this lovely – though basic – 1/10 scale buggy was quite a highly priced and exotic toy for any lucky kid to own one, way back in 1981. Because back in those days, there were very few large, ready-to-run R/C toys around at all. 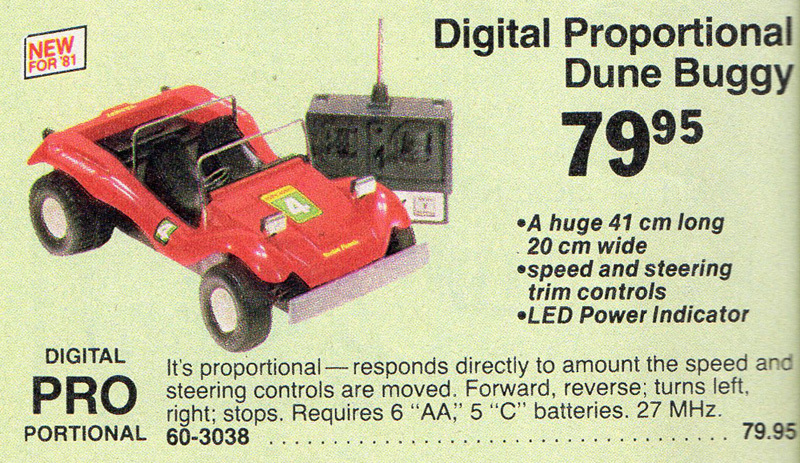 As you can imagine, since this car was the first Digital Proportional R/C model ever sold at Tandy, they wanted to trumpet this feature – hence we’ve got some “Digital PRO Portional” wording to emphasize the whiz-bang new technology. As I’ve blogged about in the past, these early toy “off roaders” had relatively limited off-road ability, in spite of the ads that claimed they could traverse “rugged terrain”. The Dune Buggy was in reality a vehicle capable of ambling along at a slow pace, mainly on smooth surfaces or very hard packed dirt, but little more than that. With no suspension, fairly low ground clearance, and tyres made of a sort of soft, squishy plastic rather than rubber, it was really only designed to entertain in an unchallenging terrain setting. But having said that, the smooth Nikko Digital Proportional radio it came with gave it a certain slow, scale charm as it glided around on the carpet. Believe me – while it may be simple on a mechanical level, cruising one of these bright yellow buggies around your living room at the quiet, steady pace they go, could not be more quintessentially 1970s. Even though it came out at the beginning of 80s. Never mind that it’s drivetrain was only powered one rear wheel 🙂 Which is a pretty extraordinary thing these days. But you know, it was probably designed to limit wear on the gearbox from the lack of a differential (without the expense of adding an actual differential to solve the problem the hard way). On the plus side, the car does have a two speed gearbox for a bit of variety in torque as you drive it around. 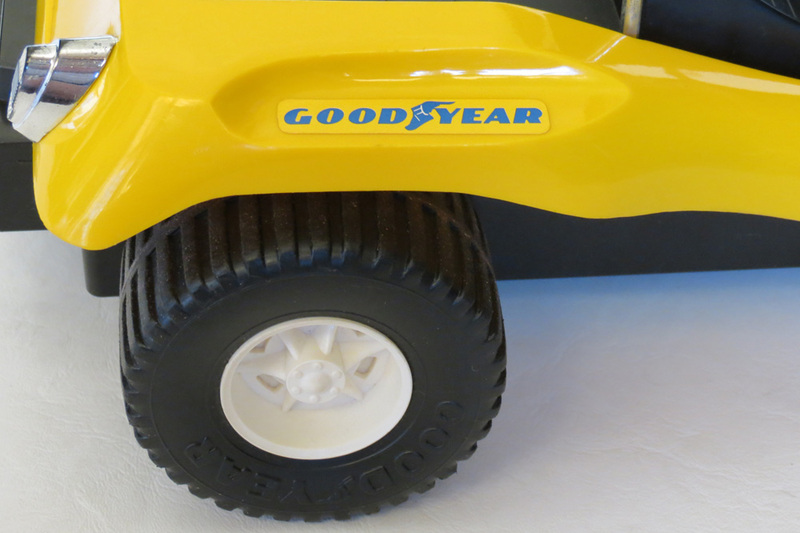 And aside of that, I would have to say it’s just a really beautiful toy R/C car – a classic, simple, and nicely scale dune buggy body shape, set off with chrome lights, metal roll bars, interior, and even some nice decals like “Goodyear” and so on. At 1/10th scale, it’s also an impressive 41cm in length. 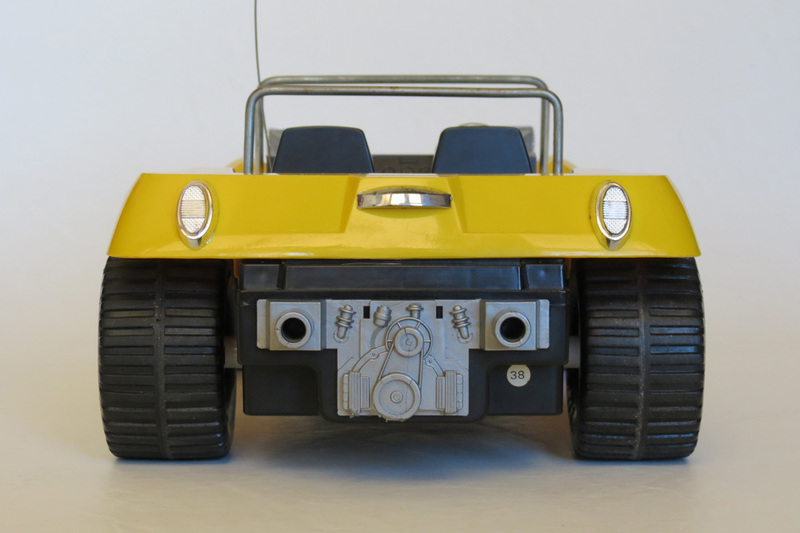 If this model was intended to be one of Nikko’s budget-priced answers to Tamiya’s famous Sand Rover R/C kit model, or the even earlier Kyosho Peanuts dune buggy, then I think it was at least a nice effort in the looks department. I’ve seen a lot of other dune buggy toys from the early-mid 1980s from other brands, and it has to be said, some of them were actually a bit ugly. But not this one. The transmitter is quite a nice piece too – a boxy, solid, digital proportional unit that feels good and would later go on to be used in many of Nikko’s top-level models. 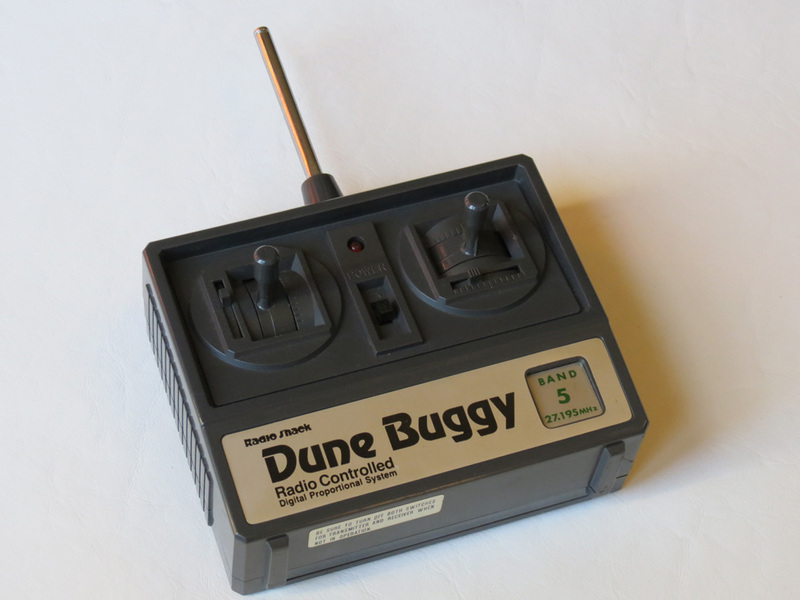 By 1983, other more capable off-road R/C toys were beginning to emerge, and the Dune Buggy was discontinued at Tandy. These days, the Dune Buggy is reasonably hard to find. Although you do seem them come up now and then – perhaps a few times a year. The original Nikko release “Road Star G2” is even more rare. Nikko soon followed the Road Star G2 with a more sophisticated dune buggy called the Big Thunder, which featured a more off-road-ready chassis, tyres, and transmission. As always, collectability and value are determined by demand. 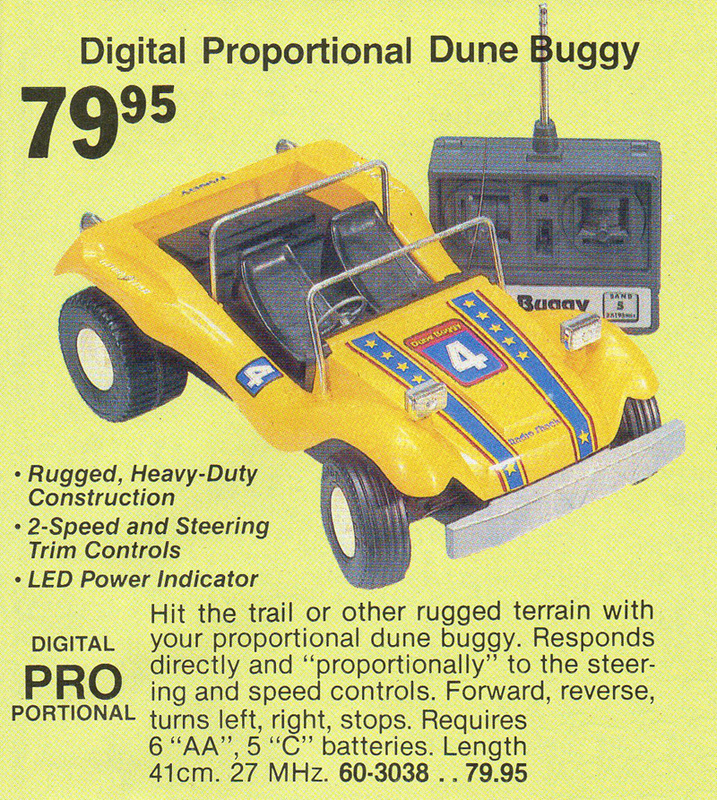 But I’d have to say that the Dune Buggy is one of my favourite early 1980s R/C toys thanks mainly to it’s good looks, and my memories of seeing it in really early Tandy catalogues. And the fact it’s such an early effort to produce a responsive, premium R/C toy car, also makes it an interesting little piece of history. It was definitely one of the first ever Digital Proportional models by Nikko too, and therefore, also one of the first ready-to-run Digital Proportional models ever made. Batteries: 5 x C (Car). 6 x AA (Transmitter). It looks very much like the “Nikko Big Thunder G3” but that has 2WD. I believe it may be quite similar to the Big Thunder 🙂 I wonder if the Big Thunder truly drives both rear wheels. 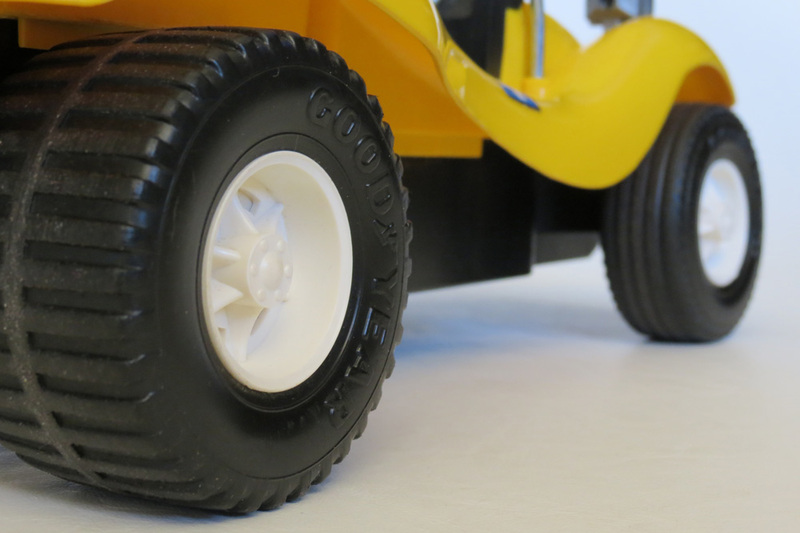 Update – the Big Thunder G3 seems to be basically the 3rd Generation hence “G3”), when the Radio Shack Dune Buggy is 2nd Generation (hence “Roadstar G2” writing underneath). The Big Thunder G3 is definitely 2WD. 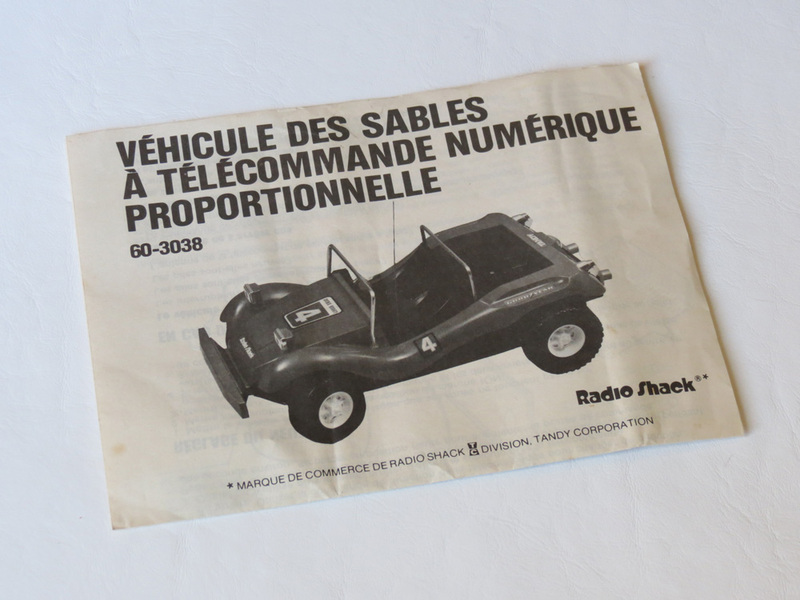 It also seems that Radio Shack versions of Nikko cars were very often cut-down versions – lower specs and features, than the original.